Alan Orantes Forst was born in Pittsburgh, Pennsylvania on December 13, 1958. Judge Forst was (and remains!) the eldest of two sons, growing up in a traditional “reformative” Jewish family, with a stay-at-home mom. The family moved three times during Judge Forst’s adolescence (to Buffalo, Chicago, and Philadelphia), before he was accepted into Georgetown University in 1976. In 1980, Judge Forst graduated with a Bachelor of Science degree from. Georgetown University’s School of Foreign Service. After Georgetown, Judge Forst went to Israel where he worked on a kibbutz, getting up at five a.m. to work in the cotton fields, pick olives and cucumbers, or fish in the Sea of Galilee. The hard work ended with afternoon rests in a hammock, reading his favorite books, Herman Wouk’s Winds of War and War and Remembrance. On return to the States, Judge Forst worked for the 1981 Presidential Inaugural Committee, followed by Reagan Administration postings at the U.S. Commission on Civil Rights, the Civil Rights Division of the U.S. Department of Justice, and the Legal Services Commission, while attending evening law school at the Columbus School of Law of the Catholic University of America from 1982 to 1985. During his last year of law school, Judge Forst coordinated the fourth annual Federalist Society national student symposium, featuring future Justices Scalia and Ginsburg, Judge Bork, Chief Justice Burger, and Senator Hatch, who was introduced by Judge Forst. “I was thinking of leaving D.C. after graduating from Georgetown, but if I had done that I wouldn’t have met my wife,” muses Judge Forst, who credits “landing on the right side of the sliding door” for his good fortune. Thirty-three years ago, Diana moved into the same D.C. house that a young Alan Forst and six other young professionals were living. They fell in love and were married five years later. This past Memorial Day weekend was the Forsts’ twenty-eighth wed ding anniversary. The Forsts played co-ed softball and football together when they lived in D.C. and Northern Virginia prior to their migration to Florida in 1998. Along the way, Alan returned to Georgetown, as the university’s hospital was where their three children were born: Amanda, age 23, and twins Andrew and Vicky, both 22 in August. Diana Orantes Forst is a dedicated chemotherapy and oncology nurse who works 12-14 hour shifts at the local hospital. She was recently interviewed for a position on the Board of Nursing with the Department of Health. Judge Forst recently accepted a position on the local board of Molly’s House, a charitable organization that arranges for the housing of patients and families of patients at the nearby hospital where his wife works. He had just come from a board meeting earlier the morning of our interview. If fate set the wheels in motion for Judge Forst’s good fortune at home, his foresight and planning had to have more to do with his career. He took the Florida Bar exam following law school and was admitted to the Florida Bar shortly thereafter. However, Judge Forst remained in D.C. for 13 years after law school graduation, first working at a legal think tank, the National Legal Center for the Public Interest, and then as a staff attorney at the U.S. Department of Education. From there, following up on a referral from his friend Clint Bolick, Judge Forst met with the Chairman of the U.S. Equal Employment Opportunity Commission, Clarence Thomas. He was hired for the position of special assistant/ counsel to the Chairman in the summer of 1987. Justice Thomas made a strong impression on Judge Forst, who remembers the future Justice as a great boss and role model, as well as a friend. “When I was Chairman (of the Florida Unemployment Appeals Commission), I used Justice Thomas as my model in dealing with the Commission’s employees, remembering how important it was to be personable and show my appreciation for each as both part of my staff as well as one of my colleagues.” Another early influence on Judge Forst was Justice/Chief Justice William Rehnquist, whose early opinions, even when the sole dissent, impressed Judge Forst for their consistency and logic. Just prior to then-Chairman Thomas’ departure from the EEOC to join the judiciary, Judge Forst moved to the U.S. Department of Labor as an official in the George H.W. Bush administration, serving at both OFCCP and the Wage and Hour Division. He continued his service as a “schedule C” Federal attorney following Bush’s loss in 1992, moving to the Merit Systems Protection Board as Legal Counsel to the Bush-appointed Vice Chair. Thus, from 1987 to 1997, Judge Forst had the opportunity to deal with labor and employment law issues from both a policy and appellate adjudicatory perspective, drafting and reviewing policy guidance, regulations and Agency decisions as well as reviewing appellate briefs filed by the EEOC. His final job in Washington was as an employment and labor law trial attorney at the U.S. Department of Commerce, with the Bureau of the Census as his principal client. Judge Forst’s parents live in Boca Raton, which was a strong influence in the Forst family moving to Florida in 1998. Judge Forst accepted a job at the Crary Buchanan law firm in Stuart, where he became partner and represented employers and employees on employment law matters. 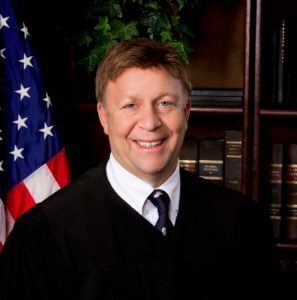 Judge Forst became active with the Florida Bar’s Labor and Employment Law Section, joining the Section’s executive council in 2000 and elected an officer in 2003 and Chairman in 2008. While at Crary Buchanan, Judge Forst became friends with his office neighbors. On one side of his office was William Roby, who was appointed to the 19th Circuit in late 1999 and would later serve as the Circuit’s Chief Judge. On the other side was Joe Negron, for whom Judge Forst campaigned during Negron’s runs for the Florida House following the resignation of Representative Tom Warner, husband of Judge Forst’s future colleague, Judge Martha Warner. Judge Forst and Representative/Senator Negron would continue their friendship when both moved to jobs in Tallahassee, occasionally guarding each other during legislative session basketball games. One day, after listening to a frustrated client bemoaning the firm’s billing statement, Judge Forst decided to investigate jobs in State government. He came across the position of Chairman of the Unemployment Appeals Commission (renamed the Reemployment Assistance Appeals Commission in 2012), determined it was a perfect fit, and submitted an application. He also convinced his friend Thom Epsky to apply for one of the two part-time Commissioner positions. The legislation creating the Commission requires the Chairman to be an attorney, with the qualifications (and pay) of a Circuit Court judge; the two other commissioners are part-time, need not be lawyers, and are paid $100/day. While their applications were pending, Epsky called Judge Forst and informed him that he had convinced his State Senator to change the statute to enable Epsky to be appointed Chairman, with Judge Forst being considered for the $100/ day position. “I was pretty sure that he was pranking me, but I nonetheless spent the following two hours making sure that there was no such legislation,” recounts Judge Forst. Governor Jeb Bush appointed Judge Forst in 2001 to serve a four year term as Chairman of the unemployment Appeals Commission. Judge Forst was re-appointed by both Governor Bush and Governor Charlie Crist in 2005 and 2009, respectively. Upon Judge Forst’s initial appointment to the Tallahassee-headquartered Commission, the entire family checked out Tallahassee and decided that rather than uproot they would remain in Palm City. Judge Forst initially commuted to Tallahassee by air, prior to changes in air service from PBI to Tallahassee forcing him to the road. During the initial years of commuting by air, Judge Forst became friends with fellow air travelers Justice Barbara Pariente, then Solicitor General Tom Warner, and then Senator Dave Aronberg. Judge Forst remained active in local organizations during his nearly twelve years of commuting, including service to his synagogue, Temple Beit Hayam, where he served as a vice president from 2006-2008, as well as the Martin County Bar Association, which he led as President in 2007-08 and organized the Association’s annual Constitution Week program. Certain D.C. loyalties remain. Judge Forst enjoys listening to the Tony Kornheiser radio show podcasts, which he downloads and listens to during the drive to the court from his home in Palm City. He is also still a loyal Washington Wizards and Georgetown Hoyas fan, as well as a Dolphins fan, though taking a time-out after a 12-year run as a season ticket holder. Judge Forst loves going to rock concerts and is the rare judge that might be found near a mosh pit listening to the music of Papa Roach, Garbage, or the Offspring. Last year, he and his oldest daughter met up with Judge Pat Kelly and her son at the Midtown Music Festival (Red Hot Chili Peppers, Weezer, and QOTSA) in Atlanta and that was Judge Forst spotted with his colleague Mark Klingensmith at the Alice Cooper concert and with Diana at last week’s Styx/Foreigner show in Estero. After the Beatles, the Foo Fighters are his favorite band. He has seen Paul McCartney in concert “about eight times” and is hoping to see him again this summer at Dodger Stadium. Judge Forst is also really looking forward to having all three of his kids with him in June during an excursion to the Firefly Music Festival in Delaware (headliners include the Foo Fighters and two of Judge Forst’s other favorites, Weezer and the Kaiser Chiefs). When not listening to Kornheiser podcasts, Judge Forst listens to Sirius radio and confesses that Lithium, Classic Vinyl, and Octane are his favorite Sirius channels. In addition to continuing on the Florida Bar’s Labor and Employment Law Section executive council, Judge Forst will be serving a second term on the Constitutional Judiciary Committee and commencing service on the Annual Convention Committee, as well as serving as the Fourth DCA’s representative on the Appellate Practice Section. He looks forward to meeting and working with members of the APS. When asked what he liked most about being on the Fourth DCA, Judge Forst didn’t hesitate in answering “my colleagues,” adding that the entire DCA staff has been very welcoming. Judge Forst summed up his feelings toward his new job by noting that he pinches himself every day that he goes to work at his dream-come-true job, and every night as he heads home to his dream-come-true family.